SafeSquid has a multi-tier cache. This section gives Information related to the Cache volumes. It displays the list of Cache files, and give users the option to search through, and if required, selectively delete them using "Delete Matches" option. The Cache Information section gives information for Memory Cache and Disk Cache Volumes. It shows the total number of objects, the total size of those objects in Bytes, and the percentage of total Cache used. It also displays the path of the various Disk Cache Volume(s). 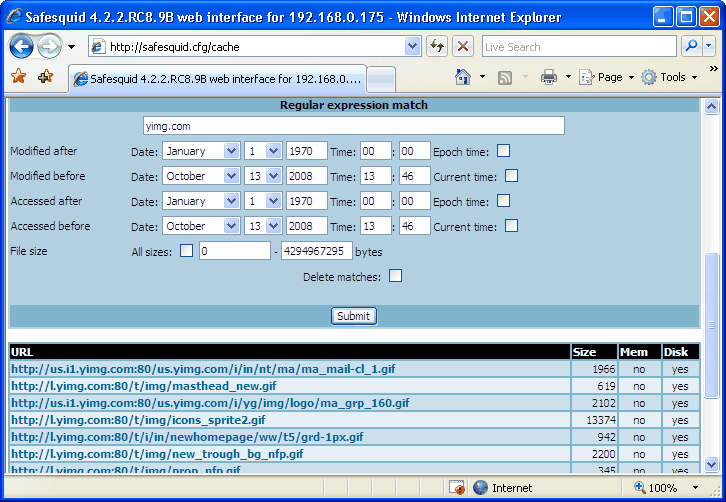 The Regular Expression Match section has a text box, where you can enter a regular expression or any word, based on which, the corresponding matches are found from Memory Cache, as well as Disk Cache, and displayed. The figure below displays the result of the search for 'yimg'. The result displays the URL, size in bytes and whether the content exists in the Memory and / or Disk Cache. You can also filter content on the basis of content modification date, accessed date and file size. On the basis of these filter criterion, all the urls that meet the specified criteria, are displayed below the regular expression match section. The "Delete-matches" option allows you to delete the resulting matches. Note: If you want to delete all the cache entries, leave the text box blank, select the "Delete matches" option, and click on the submit button. remote file or iso. If you are running one of the GNU/Linux distributions, you should already have the MD5 program installed. Epoch is an instant of time selected as a point of reference. In Linux, this time is considered as 1st January 1970. Epoch Time is the time represented in the total number of seconds from an instant of time selected as a point of reference i.e. Epoch. Hence termed as Epoch time. 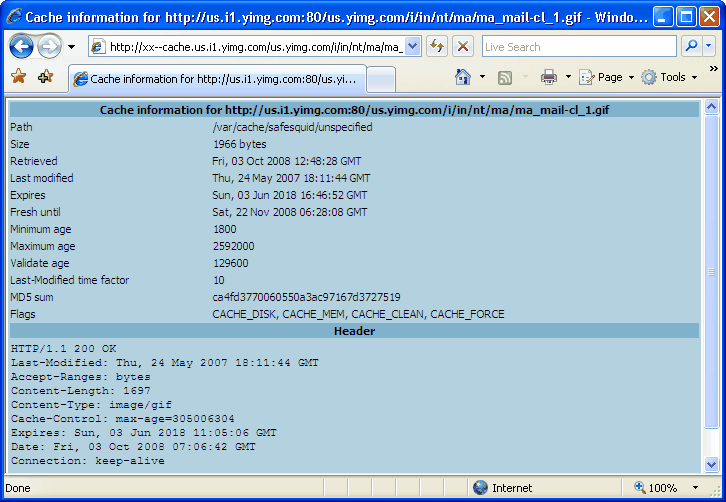 Clicking on a cache content gives you more details for the content, as shown in the figure below.